A lot of folks have expressed growing interest in my Freedom Squadron project – a Savage Worlds driven love letter to “G.I. Joe.” This entire project came about thanks to my meeting the great guys at Spyglass Games, playing their remarkable deck-building, cooperative board game and falling in love with it in every way. Not only is the game – designed by Michael Knight and Jeff Arbough – a brilliant concept that combines many different elements in ways I’ve not seen at the table before, it’s a gorgeous presentation of a world clearly inspired by the coolest stuff from our childhood, yet with modern sensibilities that excite our more sophisticated inner children. VENOM Assault is a cooperative game for 1-5 players. In VENOM Assault, players are tasked by the United Nations to thwart a global terrorist group on the edge of taking over the world, known only as VENOM. After discovering VENOM’s evil plan, the U.N. has called for the most elite soldiers of the world to gather together, work as a squadron, and stop their evil plans. As the U.N.’s greatest tacticians, players assemble their squadrons from the soldiers and vehicles that arrive from around the world in order to strengthen their forces! Players must be careful, as VENOM has already assembled their forces against the world. There is no time to waste, and your squadrons must act quickly and decisively in order to gain the upper hand. The members of Freedom Squadron will have to take on many strategically placed villains if they hope to have a chance to stop evil in its tracks! Overconfident and even shameless in my public persona, I assure you I am never unaware of how fortunate I am. I spend every day doing things that countless fellow gamers would dearly love to pursue, and I am permitted to call this my vocation (and my avocation). Today is one of those days when my cup overfloweth – not so much because of something I did specifically, but because of my good fortune to have collaborated with an all-star cast on something of great value and importance. Michael Surbrook did all the heavy lifting. Ross Watson oversaw the structure and the execution. Jason Waters took the necessary risks and made the project possible. Today, we at Evil Beagle Games (along with High Rock Press) are celebrating Aaron Allston’s Strike Force, both for the reception of the BAMFSIES Gamers’ Choice Award and for the exceptionally grand review it received on EN World. To have been a part of something like this is an honor, marking an important and cherished moment in my career. Thanks to everyone who supported it, and everyone who rightfully remembers Aaron’s work for the treasure that it is. The electronic portion of this product includes character write-ups for Mutants & Masterminds and ICONS. 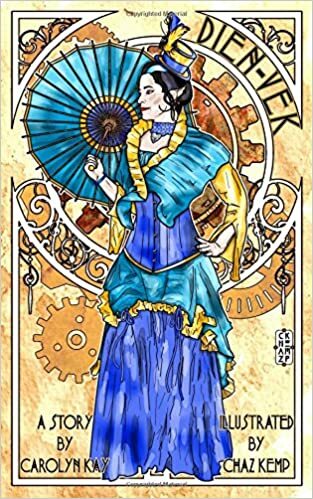 “It’s a steampunk/fantasy story about an elven princess who travels to the mortal realm to find that Queen Victoria might not be the ally her people thought she was.” – Carolyn Kay. The year is 1850 in the world of man. Fifty years ago, a comet crashed into the continent of Zorrovia, bringing destruction and a magical curse. Faerie glamour is no more. All of the fae folk—elves, trolls, goblins, gnomes, faeries and their kith and kin have been revealed to mankind. Now the mortals of Ashelon and the citizens of the Hidden Lands struggle to coexist. Galessel, Princess of the Elven court, is the newly appointed ambassador to Queen Victoria of Ashelon. She’s nervous about her new post, and curious to see for herself how the beings of the Hidden Lands are faring among the mortals. What she discovers leads her down a path that could change her world forever. Ashelon is a land where true steampunk is on display. These aren’t just pretty little Victorian tales. These are gritty stories about multi-cultural punks fighting against the establishment in an attempt to destroy Imperialism. Only one thing stands in their way: Ashelon’s Queen Victoria and the gods that are on her side. Heya, folks! As most of you know, this past weekend, on October 9th, I ran the biggest Big Epic Game of my life. If you’d like to look through the vidcast of this, here it is. Note that audio starts a 05:50, but there’s a lot of time catching up on set-up, etc.. The “official” start is at 52:11. The Heroes of the Battle of Camondel, who I thank from the depths of my heart for their acts of courage in the game, and beyond. Athrate Alystar (Howard Brandon) – Sergeant Major of the Grey Rangers, orphaned and raised by the Church of Light as a priest and paladin, known for executing extremely dangerous missions and emerging threats with a high degree of discretion. Bahiya bint Al’Shams (Ben Keeler) – Light-Blessed Priestess of Raz-Dash, Emissary of the Desert Princes, Scourge of Heretics. Bayanai the Banal Wanderer (Matthew Dimalanta) – Mysterious Offspring, distant from the world… but determined to see the machinations of the Merchant and his ilk undone, at all costs. Cairos (Josh Weber) – The millennia old Archmage, willing to endure everything to bring back everyone. Chiron (Richard Higbee) – Ambassador from the Elven Council, youngest of the ascended faelakar, archmage, not afraid to get his hands dirty when it comes to aiding or protecting the younger races. Damon Severance (Aaron Acevedo) – Bishop of the Church of Light, former Cardinal of the Prelacy, master of strategy and intelligence work for his new church. Drufus (Scott Crosson) – Archer, tactical specialist, and wearer of a mysterious artifact hat with a special history. Talented, courageous, and stylish, Drufus is a welcome surprise for the allies of Light and Life. Erta Wanderer (Benjamin Boardwell) – Tubby Dregordian fencer, merchant lord. friend to all, and founder of Sog’s first criminal rehabilitation center. Felosia Naïlo (Chris Parks) – High Druid of the Phoenix Moth Grove and Practitioner of the Unusual, Felosia is the bane of enemy plans and boon to allied efforts. Gunther (Jessica Willow) – Olaran crossbow expert and silent warrior against the forces of Darkness and Flame. The worst nightmare of enemy commanders. Jennifer of Thornwood (Marian Waldman) – 6th Company of the Silver Unicorn, Knight Commander of the Order of the Silver Rose, chosen of Archanon, beholden to no mortal power. Juliette LeFleur (Carinn Seabolt) – Master fencer, consummate spy, child of many worlds, and “Brother Breeze” to many of the Society. Kaedan (Katherine Strasser) – Aevakar sorcerer who left home in search of adventure with friends as a youth only to find himself embroiled in the conflict between Light and Darkness, Flame and Life. Kassegore, the Beast (Daniel Wong) – Once considered only a mindless berserker, now proven a deadly capable tactician, leading an elite mercenary army – whether as a liberator or a destroyer remains to be seen. Sable (Craig Henson) – One of a long line of Danatarans to bear the mantle of this Special Agent of the Crown of Galea. Ta’Or Challa (Mike Anthony Lythgoe) – a Korindian master of the Way of Kor, honorable and devoted Grey Ranger, committed to the protection of the innocent and holding the unjust accountable. Vhen the White (David Forby) – Snow Leopard Brinchie orphan, Kor-In Master, clawless orphan, and humble Grey Ranger, bearer of the Flute-Staff, and hero of the Battle of Chimeara’s Tower. The Vrrll (Charles Jones) – Powerful, ogre-sized brinchie-like and immortal servant of the Silver Unicorn, often arriving at the most dire and important times. Woundrouys (Michael Satran) – Courageous and flamboyant Korindian master of martial arts, applying equal measures of humility and brazen daring at the risk of life and limb. Zebadiah Stone (Donavin Santini) – Accidental criminal mastermind, founder of the Stonewright Guild (“Building a better future, one Stone at a time”), secret alter ego to the Priest of Light Salvator DeMartis when he needs to wander the dark places of the criminal underworld. We must also thank Alida Saxon, Rob Towell, David Vibbert (aka Cedrus, Left Hand of the Patriarch), James Olexa (aka the Mysterious Lord Velkalar, ally of the Prelacy), Rae Ramirez, Annabel Bugg, Ruben Rivera (aka Murvoth the Mighty), Shawn Gustafson, Erin Barnard (aka Weega Ratstabber), Scott Field, Ross Winn (aka “The Mysterious One-Eyed Old Man”), Chelvanaya Gabriel (aka Captain Venna), Paul Wilcox (aka Elindur), Timothy Baker, David Espinosa, Max Battcher (aka Skeiron), Brett Smith(aka Thaleon), Gail Seidenberg, Elizabeth Burnside, James Dillon, Janice Kuschner, Shawn and Andy Parker, Logan Goolsby, and of course, the leader of “Team Ed,” who helped manage the day and the effort, Ed Doolittle! Hail the Heroes of Shaintar, and Hail the Warriors Who Stand with the Mighty T! Heya, folks! Something I am getting involved with here in the Rocky Mountain area that I wanted to share with you all – The Big Show, and it’s related channels, the Big Show Cosplay Channel and the Big Show Games and Tech Toys Channel. They want to become a network and media outlet for all things geeky in the Rocky Mountain area, which is one of the geekiest places I’ve every known (and, as most of you know, where I live now). Check out the interview I did with them while at Tacticon this weekend! I’ve met and been hanging out with some great folks, including Super Dave Raines, Jeremy Broadwell, and the stunning and enticing High Priestess of Nerd (AKA Bobbi Forester), and I am looking forward to helping them develop this into some serious fun and informative and entertaining stuff! This is one of those times when I feel it’s very important to use the SPOD to get the word out about something important to all of us. Dungeons & Dragons is all about creativity. For more than 40 years, the folks who spent the bulk of their time creating amazing adventures, those noble Dungeon Masters, did not have a convenient outlet to share them with the gamers who weren’t sitting at their table. You either had to raise money to publish a physical book or zine on your own, or convince a publisher you had the chops. Now, the Dungeon Master’s Guild puts the power to share that creativity firmly in the hands of the DM. The Dungeon Masters Guild is a collaboration between Dungeons & Dragons and our friends at DriveThruRPG, and it is designed to support and reward you – whether you’re an experienced DM or just starting out. Today, you can upload your creations to the DMs Guild website, as well as browse submissions from some of gaming’s most esteemed designers. Read more of the news at my friends’ site – Flames Rising – or click to logo to go straight to the Guild page. Honestly, I never imagined I’d have a title on Steam, of all places. But there it is! The first of three Visual Interactive Novels I wrote for the Deadlands Noir setting, gussied up by the fantastic folks at Smiteworks and featuring the art of the awesome Cheyenne Wright! If this one does well, this may mean a lot more of the style and even other settings, so your support is greatly appreciated! A Visual Novel set in the Deadlands Noir RPG Setting from Savage Worlds. New Orleans, 1935. Whoever called this “The Big Easy” sure got that one wrong. Things are tough all over. Honest work is hard to find, and even dishonest jobs are getting scarce. The one thing that’s not in short supply is trouble. From shady thugs to crooked cops to mafia soldiers, there’s plenty of characters out there looking to give an honest Joe a hard time. And that’s not the worst of it. There are stories going round about things that go bump in the night. Things you wouldn’t want to meet in a dark alley on a darker night. And those stories aren’t just coming from rummies or saps who read that epitaph rag. Still, there are a few heroes left in the concrete jungle. Steely-eyed private dicks, fast-talking grifters, wild-eyed inventors, and shadowy houngans still struggle against the encroaching darkness. With enough moxie–and more than a little luck–they might just be enough to turn the tide. This is just one story. The story of Harvey Jenkins, Private Investigator. This story was written by Sean Patrick Fannon, Lead Designer and Brand Manager for Savage Rifts and author of numerous RPG products such as Shaintar: Legends Arise and The Fantasy Roleplaying Gamer’s Bible. The story is set in the Deadlands Noir RPG Setting created by John Goff, Shane Hensley, Clint Black and Sean Preston. The soundtrack was produced by Harry Mack for the Deadlands Noir Kickstarter and has been incorporated here as compelling background music. Cheyenne Wright produced all the images and artwork. The original concept was produced by Brendan Quinn and converted into it’s final form by Doug Davison, using the Ren’Py visual novel creation software. Editing was provided by Sara Quinn. If you like this story, please look for more stories featuring Harvey Jenkins in The Big Easy. I interrupt your regularly-scheduled whatever-it-is-you’re-doing to bring you this head-exploding awesome piece of news. My friends at Green Ronin Publishing and the ever-dorkable Wil Wheaton have put together a package of epic entertainment. The long-promised Tabletop RPG spinoff is coming, and it’s Wil running a brand new world he created using GR’s Fantasy AGE system. Check the announcement here, and watch the video. I am very happy for all involved, and look forward to seeing how this all plays out.